The plot and execution of Kill the Ninja - despite the promising title - is pretty standard chop-socky stuff. It’s about a group of three buddies, Pong Macao, Sutaro and King Kim, the latter two being Japanese and Korean illegal immigrants, living in Hong Kong. They manage to get a hold of a golden Buddha statute with two million dollars in it. Henceforward they have to face both internal strife as well as threats from outside their circle of friendship. Much punching and kicking ensue. It’s surprising that this was directed by Woo-sang Park, the man behind the all-time classic Miami Connection (1987), as well as L.A. Streetfighters (1985), because this outing doesn’t have the sense of style, wackiness and fun his later projects had. But I guess you have to start somewhere. Kill the Ninja is, if nothing else, a testament to the power of the Ninja Boom of the 80’s. 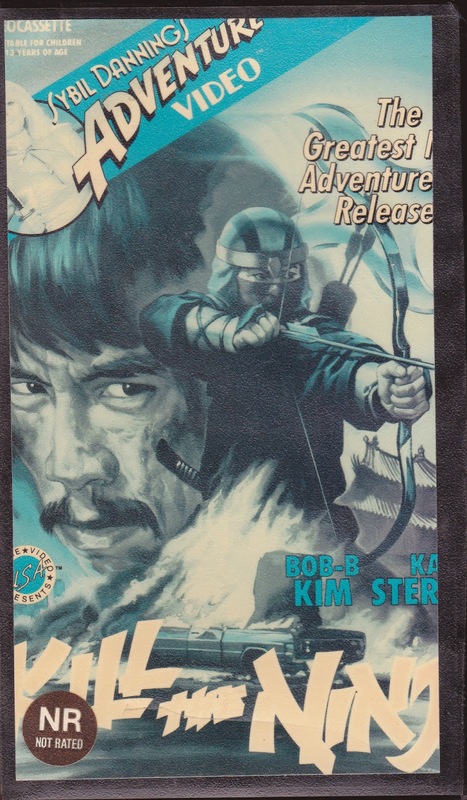 Video stores were so hungry for ninja-based product, you could release a movie called Kill the Ninja - which has absolutely no ninjas in it - and no one complains. As previously stated, it’s a Hong Kong beat-em-up, with no connection whatsoever to Japanese ninjas. Such was the heat of the Ninja Boom movement. It may not have any ninjas (maybe they were speaking metaphorically, where the “ninja” represents the darkness in men’s hearts...hey, we’re not beyond an absurd reach here), but it does have men fighting in leisure suits, and the time-honored disco scene and sax on the soundtrack. Plus it has one of the best “jumping” scenes we’ve seen to date. And we’ve seen a lot of jumping over the years. You’ll know what we’re talking about if you ever see it. Truly the main reason to see or own this VHS is because it was part of the “Sybil Danning’s Adventure Video” series released by USA video. It’s just so gloriously 80’s and something that could never occur today. Sybil Danning does a little intro and outro before and after the movie. And the fact that she’s presenting a Ninja Boom movie just makes it 80’s on top of 80’s. Who could do such a thing today? And on what format? DVD? Seems unlikely. If only Danning was introducing something a bit better, not to mention easier to see (the movie is exceedingly dark in many places, a pitfall we see all too often). So to recap, the best parts of the tape are the Sybil Danning bits, as this is before the career of Woo-sang Park really took off. The whole package somewhat works as a curio from our favorite decade, but the movie overall is lackluster and we wouldn’t tell you to go out of your way to find it based solely on its own merits. But 80’s fans may want to pick this up if they can find it cheap. One ninja film I would recommend is Deadly Life of a Ninja. Cool! Thanks for the suggestion.